This or Any Other Solar System, the debut release by 15 year old Andrew Edstrom, certainly reminds us that there is a new generation of guitarists on the horizon. This new group of young guitar wizards have much history to draw from. Edstrom has done his homework, and indeed, done it well. The ghosts of many timeless guitar masters are resurrected and celebrated in this recording with the greatest passion and respect. Edstrom has, however, somehow managed to take this legacy and sculpt it into something very much his own. He not only understands where the guitar has been, but like all great artists, explores and gently nudges the instrument to places it hasn't been. These 11 original guitar instrumentals tell a wonderful story with focus and technical expertise, as well as the vision and optimism that only a new generation of players can offer. Rest assured...we will be hearing more from Andrew Edstrom! Kenn Fox - slide guitar on "Swamp Thing"
Produced by Kenn Fox. 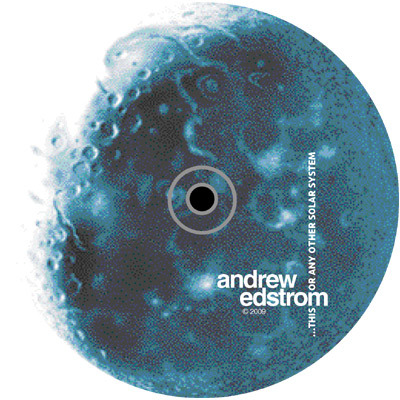 All compositions by Andrew Edstrom. (Translation - this is the best translation we have so far) "Not so long ago you could read the discussion here of the newest of Mare Edstrom, Way Beyond The Blue, a beautiful album full of blues gospel influences, as usual made together with her right hand, the guitarist Kenn Fox. Artist Mare is also owner of her own small record label, Spiritone Records, and on that label appear in addition to her own releases some CDs of other artists and bands from around Wisconsin, where the label is located. One of these releases is that of her son, Andrew. It is a completely instrumental album. Andrew is a guitarist and situate in the fusion angle, if you would want to put a label on his music. The CD is not new anymore -- he appeared in 2009, when Andrew Edstrom was only 15, but just now, by happenstance, came to our attention. Striking is the very fact that Andrew, despite his young age, fills his debut with 11 of his own compositions, all very original in approach, but clearly with their feet in the blues, which is understandable with his genes. What we hear are modern guitar compositions, the spirit of former guitar masters within it, but added to. He lets his guitar tracks entered which few before him. This creates a sort of great atmospheric guitar paintings, miniature soundtracks, as it were, that make you dream of their bluesy tones. It made me think of a similar CD, Riviera, of the lesser known guitarist Fab Tranzer a few years ago much impressed me and to which I very often listen with pleasure. Also here you get the same kind of instrumental impressions, especially in a song like "Samson's Last Prayer" or "(Falling) A Sunset Just For You." Other songs are a bit more rhythmic in approach, and as I said the blues runs like a thread throughout the entire CD. Andrew has created his own style musical legacy that impresses. The young man has already heelwat technology in house, remember that since these recordings are now three years old. So I'm curious what new quick work of him to hear, for that we will hear from him for sure!"